Alfred Hitchcock in 1956 by photographer Fred Palumbo. Alfred Joseph Hitchcock, KBE (August 13, 1899 – April 29, 1980) was a British-American film director closely associated with the suspense thriller genre. He began directing in Britain before working in the United States from 1939 onwards. With more than fifty feature films to his credit, in a career spanning six decades, from silent film to talkies to the color era, Hitchcock remains one of the best known and most popular directors of all time, famous for his expert and often unrivaled control of pace and suspense throughout his films. Hitchcock was the quintessential master of suspense. One aspect that is under-appreciated, however, is his treatment of the question of human identity. His characters always face some dilemma, whether natural or, as in The Birds, supernatural. Often it is being falsely accused of some crime. In the process of working through the dilemma, the character's identity is usually unmade and then remade. Often, the interregnum between unmaking and remaking is marked by some form of amnesia or liminal state. During the course of the film, a kind of rebirth often takes place. While Hitchcock has a morbid sense of humor, and his films often portray characters caught up in some criminal enterprise, nonetheless they have an infectious optimism about the human spirit's ability to overcome its dark side. Although Hitchcock was an enormous star during his lifetime, but he was not usually ranked highly by contemporary film critics. Rebecca was the only one of his films to win the Academy Award for Best Picture, although four others were nominated. He was awarded the Irving G. Thalberg Memorial Award for lifetime achievement in 1967, but never won an Academy Award of Merit. The French New Wave critics, especially Eric Rohmer, Claude Chabrol, and Francois Truffaut, were among the first to promote his films as having artistic merit beyond entertainment. Hitchcock was one of the first directors to whom they applied their auteur theory, which stresses the artistic authority of the director (over the competing authorities of the screenwriter or producer) in the film-making process. Indeed, through his fame, public persona, and degree of creative control, Hitchcock transformed the role of the director, which had previously been eclipsed by that of the producer, especially in the studio system of Hollywood. Hitchcock often used a storyboard, mapping out every shot in advance. Today, Hitchcock is seen as the quintessential director who manages to combine art and entertainment in a way very few have ever matched in motion picture history. Alfred Hitchcock was born on August 13, 1899, in Leytonstone, London. He was the second son and youngest of the three children of William Hitchcock, a greengrocer, Emma Jane Hitchcock (nee Whelan). His family was Irish Catholic. Hitchcock was sent to Catholic boarding schools in London. He has said his childhood was very lonely and sheltered. At 14, Hitchcock's father died and he left the Jesuit-run St. Ignatius' College, to study at the School for Engineering and Navigation. After graduating, he became a draftsman and advertising designer with a cable manufacturing company. After graduation from the School for Engineering and Navigation, Hitchcock became intrigued by photography and started working in the fledgling film industry in London. In 1920, he obtained a full-time job at Islington Studios under its American owners, Players-Lasky, and their British successors, Gainsborough Pictures, designing the titles for silent movies. In 1925, Michael Balcon of Gainsborough Pictures gave him a chance to direct his first film, The Pleasure Garden. Hitchcock was quickly recognized as a major talent in a new industry with plenty of opportunity. He rose quickly. His third film, The Lodger: A Story of the London Fog was released in 1927. Like many of his earlier works, it was influenced by Expressionism in Germany. In it, attractive blondes are strangled and the new lodger played by Ivor Novello in the Bunting family's upstairs apartment falls under heavy suspicion. This is the first truly "Hitchcockian" film, incorporating such themes as the "wrong man." In 1926, Hitchcock married his assistant director Alma Reville. The two had a daughter, Patricia, in 1928. Alma was often considered Hitchcock's closest collaborator. She wrote some of his screenplays and worked with him on every one of his films. In 1929, he began work on his tenth film, Blackmail (1929). While the film was in production, the studio decided to make it one of Britain's first sound pictures. Hitchcock was working for Michael Balcon at Gaumont-British Picture Corporation in 1933. His first film for the company, The Man Who Knew Too Much (1934), was a success. His second, The 39 Steps (1935), is often considered the best film from his early period. His next major success was in 1938, with The Lady Vanishes, a clever and fast-paced film about the search for a kindly old Englishwoman played by Dame May Whitty, who disappears while on board a train in the fictional country of Vandrika (a thinly-veiled reference to Nazi Germany). This is the first film that takes up another prominent Hitchcock theme, amnesia. By the end of the 1930s, Hitchcock was at the top of his game artistically, and in a position to name his own terms when David O. Selznick managed to entice the Hitchcocks across the ocean to Hollywood. With the prestigious picture Rebecca in 1940, Hitchcock made his first American movie, although it was set in England and based on a novel by English author Dame Daphne du Maurier. This Gothic melodrama explores the fears of a naïve young bride who enters a great English country home and must grapple with a distant husband, a predatory housekeeper, and the legacy of the dead woman who was her husband's first wife. The film won the Academy Award for Best Picture of 1940. Hitchcock's gallows humor continued in his American work, together with the suspense that became his trademark. Due to Selznick's perennial money problems and Hitchcock's unhappiness with the amount of creative control demanded by Selznick over his films, Hitchcock was subsequently loaned to the larger studios more often than producing Hitchcock films himself. Hitchcock's work during the early 1940s was very diverse, ranging from the romantic comedy, Mr. & Mrs. Smith (1941), to the dark and disturbing Shadow of a Doubt (1943). Shadow of a Doubt, his personal favorite, is considered by critics as a breakthrough film. The film opens with the same five "establishing shot" sequence for its two lead characters, visually establishing the relationship between its heroine, the young Charlotte "Charlie" Newton (Teresa Wright), and her beloved uncle Charlie Spencer (Joseph Cotten), whom she eventually grows to suspect is the “Merry Widow” killer. The close identification of the two lead characters intensifies and is ultimately resolved, as the film concludes in a confrontation and death struggle between its two protagonists on a moving train. In its use of overlapping characters, dialogue, and close-ups, the film further extended Hitchcock's investigations into the questions of identity. Spellbound, pairing Gregory Peck with Ingrid Bergman, explored the then very fashionable subject of psychoanalysis, although the plot centered not on the Oedipus complex, but rather on Freud’s earlier theory of traumatic shock and amnesia. This film picks up a motif that was introduced in The Lady Vanishes and makes it central to the storyline. Traumatic shock and amnesia again allowed Hitchcock to further explore questions of identity. As with many of Hitchcock’s suspense films, Spellbound is built on a twin premise, the unraveling of the suspense coinciding with the development of a love story. It featured a dream sequence which was designed by Salvador Dali. The actual dream sequence was considerably cut from the original planned scene that was to run for some minutes but proved too disturbing for the finished film. Notorious (1946), with Ingrid Bergman, linked her to another of his most prominently recurring stars, Cary Grant. Featuring a post-war plot about Nazis, uranium, and South America, Notorious is considered by many critics as one of Hitchcock's masterpieces. It also highlighted another of Hitchcock’s signatures, the inventive use of the camera. The perspective shot of Devlin (Grant) from the point of view of the reclined and hung over (Bergman) and the high shot of Bergman hiding the key to the wine cellar are two examples of Hitchcock’s visual art. Alfred Hitchcock's Rope, his first color film, came next in 1948. Here Hitchcock experimented with marshalling suspense via the use of exceptionally long takes of up to ten minutes are among his best known themes and devices. Rope features Jimmy Stewart in the leading role. Based on the Leopold and Loeb case of the 1920s, Rope has echoes of Raskolnikov’s theory of crime in Fyodor Dostoevsky's Crime and Punishment. With Strangers on a Train (1951), Hitchcock combined many of the best elements from his preceding British and American films. Two men casually meet and speculate on removing people who are causing them difficulty. One of the men, though, takes this banter entirely seriously. With Farley Granger reprising some elements of his role from Rope, Strangers continues the director's interest in the narrative possibilities of blackmail and murder. Three very popular films, all starring Grace Kelly, followed this. Dial M for Murder was adapted from the popular stage play by Frederick Knott. This was originally another experimental film, with Hitchcock using the technique of three dimensional (3D) cinematography. It was followed by Rear Window and To Catch a Thief, set in the French Riviera, pairing Kelly with another Hitchcock favorite, Cary Grant. Rear Window, pairing Kelly with James Stewart, would signal the beginning of Hitchcock’s greatest period. The film opens with a camera pan over the courtyard, as the film’s narrative and visual structure are intertwined. The wheelchair-bound Stewart, cared for by his nurse portrayed by Thelma Ritter, observes the movements of his neighbors across the courtyard, slowly becoming convinced that the traveling salesman, Lars Thorwald played by Raymond Burr, has murdered his wife. As Stewart watches the lives of his neighbors unfold, he becomes ensnared in the unfolding plot, much like the viewer of a film. His relationship with the “too perfect” Lisa (Grace Kelly) only ignites when she becomes involved in the action in the courtyard. In 1958, Hitchcock released Vertigo, a film almost universally agreed to be his masterpiece, which starred Jimmy Stewart, Kim Novak, and Barbara Bel Geddes. This film reworked the thematic material of Spellbound, using the plot devise of amnesia, but unlike Spellbound, and later Marnie, the traumatic amnesia is what Hitchcock to to as only a “MacGuffin” to ignite the real plot, a tale of murder and obsession. Three more recognized classics followed: North by Northwest (1959), Psycho (1960), and The Birds (1963). North by Northwest, starring Cary Grant, is another one of the “wrong man in the wrong place” stories that climaxes in the famous scene on Mount Rushmore. It is also famous for the scene of the crop duster chasing Grant through the corn field. The latter two were particularly notable for their unconventional soundtracks, both by Bernard Herrmann: the screeching strings in the murder scene in Psycho pushed the limits of the time, and The Birds dispensed completely with conventional instruments, opting instead for an electronically produced soundtrack. These were his last great films, after which his career slowly wound down. After his film career wound down, Hitchcock became known to a whole new generation through his television show, which had a famous opening sequence in which he would step into the portly outline of his profile. Hitchcock was made a Knight Commander of the British Empire on January 3, 1980, by Queen Elizabeth II, just four months before his death on April 29, and long after he had become a U.S. citizen. 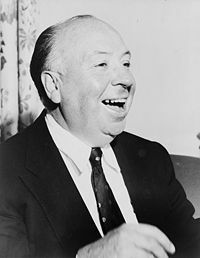 Alfred Hitchcock died of renal failure in his Bel Air, Los Angeles, home at the age of 80 and was survived by his wife Alma Reville Hitchcock, and their daughter, Patricia Hitchcock O'Connell. His body was cremated, and apparently there was no public funeral or memorial service. Hitchcock preferred the use of suspense over surprise in his films. As he explained it, in creating surprise, the director assaults the viewer with frightening things. In suspense, the director withholds from the characters important information that he shares with the audience, and then artfully builds tension around it. In suspense, the director shows the audience the bomb under the table, then lets them wonder if the characters will discover it in time. Hitchcock was a consummate artist who reflected about the nature of his art in his filmmaking. Rear Window (1954) is a reflection on filmmaking, in which Hitchcock assigns the various roles of his craft to characters in the film. Two of the people that L.B. Jeffries (James Stewart) observes from his window are “the dancer” and “the composer.” Jeffries, “the photographer,” stands in for the filmmaker himself. Despite some disparaging reflections on the ethics of voyeurism, the story reaches its climax only when Lisa and the nurse leave Jeffries’ apartment and enter into the field of action, first the courtyard and later Thorwald’s apartment, breaking down the barrier between viewer and actor. North by Northwest continues the self-reflection on art. Cary Grant plays Roger Thornhill, an ad executive who is mistaken for a secret agent, who we later find out is the creation of "The Professor," the director of an ultra secret government intelligence agency. He creates the character and manipulates his “movements” in the same fashion as the director of a film. When Thornhill is brought to the enemy agent (James Mason) they circle the room, closing the curtains and turning up the house lights, as if preparing for a “show.” Mason comments that Thornhill’s "performance" turns the room into a veritable theater. Hitchcock’s use of music to support the artistic and thematic elements of the film was crucial to his overall artistic vision. In addition to the jarring soundtracks of Psycho and The Birds, in Rear Window, the composer is working on a song about a "Lisa" throughout the film, but subtly introduces the strands of Nat King Cole’s “Mona Lisa” into the score. The lyrics of that song—“are you real…or just a cold and lonely work of art” reflect Jeffries’ attitudes toward his girlfriend. “She’s too perfect,” he complains. In Vertigo, the score not only has a “hypnotic” quality to enforce the theme of “vertigo,” but it has repetitious, circular quality as well, reinforcing a theme introduced by the two main characters, who both describe their vocations as “wandering around.” In North by Northwest, the opening sequence combines a visual graphic of lines criss-crossing and a camera view of traffic at an intersection with a cacophonous score of intersecting musical themes. One of Hitchcock's favorite devices for driving the plots of his stories and creating suspense was what he called the "MacGuffin." The plots of many of his suspense films revolve around a MacGuffin: a detail which, by inciting curiosity and desire, drives the plot and motivates the actions of characters within the story, but whose specific identity and nature is unimportant to the spectator of the film. In Vertigo, for instance, "Carlotta Valdes" is a MacGuffin; she never appears and the details of her death are unimportant to the viewer, but the story about her ghost's haunting of Madeleine Elster is the spur for "Scottie's" investigation of her, and hence the film's entire plot. In Notorious the uranium that the main characters must recover before it reaches Nazi hands serves as a similarly arbitrary motivation: any dangerous object would suffice. State secrets of various kinds serve as MacGuffins in several of the spy films, like The 39 Steps. The point of the MacGuffin is that it drives the actions of the characters within the film, but its discovery is not important to the audience itself. Most of Hitchcock's films contain cameo appearances by Hitchcock himself: the director would be seen for a brief moment boarding a bus, crossing in front of a building, standing in an apartment across the courtyard, or appearing in a photograph. This playful gesture became one of Hitchcock's signatures. As a recurring theme, he would carry a musical instrument—especially memorable was the large cello case that he wrestles onto the train at the beginning of Strangers on a Train. In his earliest appearances he would fill in as an obscure extra, standing in a crowd or walking through a scene in a long camera shot. But he became more prominent in his later appearances. Hitchcock seemed to delight in the technical challenges of filmmaking. In Lifeboat, Hitchcock sets the entire action of the movie in a small boat, yet manages to keep the cinematography from monotonous repetition. His trademark cameo appearance was a dilemma, given the claustrophobic setting; so Hitchcock appeared on camera in a fictitious newspaper ad for a weight loss product. In Spellbound, two unprecedented point-of-view shots were achieved by constructing a large wooden hand (which would appear to belong to the character whose point of view the camera took) and outsized props for it to hold: a bucket-sized glass of milk and a large wooden gun. For added novelty and impact, the climactic gunshot was hand-colored red on some copies of the black-and-white print of the film. Rope (1948) was another technical challenge: a film that appears to have been shot entirely in a single take. The film was actually shot in eight takes of approximately 10 minutes each, which was the amount of film that would fit in a single camera reel; the transitions between reels were hidden by having a dark object fill the entire screen for a moment. Hitchcock used those points to hide the cut, and began the next take with the camera in the same place. His 1958 film Vertigo contains a camera trick that has been imitated and re-used so many times by filmmakers, it has become known as the Hitchcock zoom. Although famous for inventive camera angles, Hitchcock generally avoided points of view that were physically impossible from a human perspective. For example, he would never place the camera looking out from inside a refrigerator. Hitchcock had trouble giving proper credit to the screenwriters who did so much to make his visions come to life on the screen. Gifted writers worked with him, including Raymond Chandler and John Michael Hayes, but rarely felt they had been treated as equals. Hitchcock once commented, "The writer and I plan out the entire script down to the smallest detail, and when we're finished all that's left to do is to shoot the film. Actually, it's only when one enters the studio that one enters the area of compromise. Really, the novelist has the best casting since he doesn't have to cope with the actors and all the rest." Hitchcock was often critical of his actors and actresses as well, dismissing, for example, Kim Novak's performance in Vertigo, and once famously remarking that actors were to be treated like cattle. In response to being accused of saying “actors are cattle,” he said, "I never said they were cattle; I said they were to be ‘treated’ like cattle." Hitchcock saw reliance on actors and actresses as a holdover from the theater tradition. He was a pioneer in using camera movement, camera set-ups, and montage to explore the outer reaches of cinematic art. Hitchcock's film Rebecca (1940) won the Academy Award for Best Picture in 1940, although the award was given to producer David O. Selznick. As a producer, Hitchcock received one Academy Award Best Picture nomination for Suspicion (1941). He was nominated as Best Director for five of his films: Rebecca, Lifeboat* (1944), Spellbound (1945), Rear Window, and Psycho. He received an honorary Oscar in 1968 and was knighted in 1980. From 1955 to 1965, Hitchcock was the host and producer of a long-running television series entitled Alfred Hitchcock Presents. While his films had made Hitchcock's name strongly associated with suspense, the TV series made Hitchcock a celebrity himself. His irony-tinged voice, image, and mannerisms became instantly recognizable and were often the subject of parody. He directed a few episodes of the TV series himself and he upset a number of movie production companies when he insisted on using his TV production crew to produce his motion picture Psycho. In the late 1980s, a new version of Alfred Hitchcock Presents was produced for television, making use of Hitchcock's original introductions. The Ring (1927), an original story by Hitchcock. Truffaut, François: Hitchcock. Simon and Schuster, 1985. A series of interviews of Hitchcock by the influential French director. This is an important source, but some have criticised Truffaut for taking an uncritical stance. Leitch, Thomas: The Encyclopedia of Alfred Hitchcock. Checkmark Books, 2002. An excellent single-volume encyclopedia of all things Hitchcock. Hitchcock's Style Online exhibit from screenonline, a website of the British Film Institute. This page was last modified on 2 March 2019, at 23:53.